Climategate: US Department of Energy Issues Order to Preserve All Documents Related to the CRU! 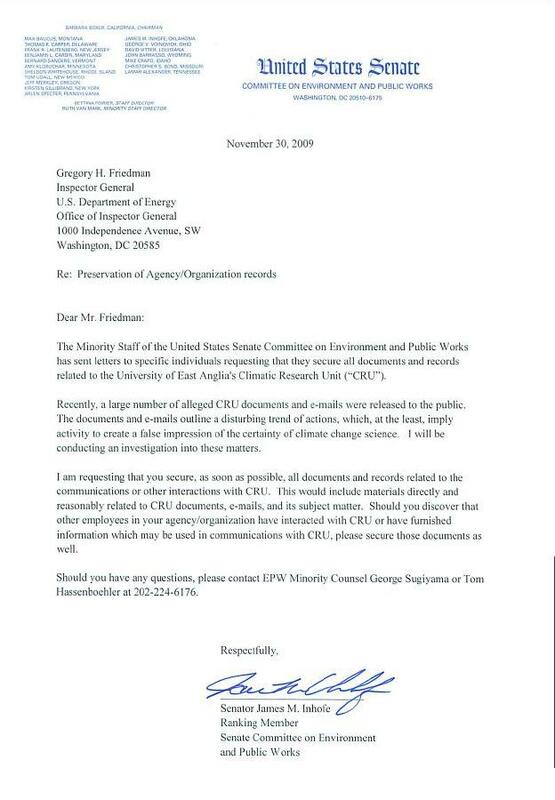 In a surprising move, the United States Department of Energy on Monday morning issued a “Litigation Hold Notice” directing its employees to preserve all documents and data relating to the Climate Research Unit at the University of East Anglia. A litigation hold order requires all personnel to preserve the information in anticipation that it may become evidence in judicial or investigative actions. What this means is that enough traction has been gained by the climategate revelations that the Inspector General in the Department of Energy now realizes that the agency may be liable if it destroys any information relevant to the case. One would wish that the order were broader and included other US agencies including the National Oceanographic and Atmospheric Administration and the NASA Goddard Institute as well, but it is an important first step in securing evidence. The Litigation Hold Notice appears to have been triggered by a letter from Senator Inhofe (see copy below) which was written back on November 30th. Why did it take two full weeks for the DOE to comply? The Examiner has a posting here. I haven’t read through ALL of the responses, but there’s a point here I’d like to make. This “notice”, in effect, is not so much an order to preserve documents, as a WARNING to DESTROY them. For the really incriminating stuff, there’s nothing to lose by destroying it, even if you get caught destroying it. Our lawyer friend mentioned certain “sanctions”, which basically revolved around the the prosecution being able to assume that the destroyed documents were “bad” for the defendant. But this is certainly couldn’t be any worse than what the documents ACTUALLY showed. And it only helps the prosecution if the destroyers are caught. And if an individual gets caught destroying stuff, he’ll just claim it was accidental – that he didn’t know that file had anything to do with global warming; or he just likes to clean out his old email messages once a month; or he missed that memo from the Legal Counsel. Of course, computer experts know that, unless you’re really, really computer savvy, no electronic document is EVER completely destroyed – there’s a backup somewhere. But I wonder how diligent DOE’s IT techs will be in ferreting out document destruction and finding the backups. I wonder how far Obama’s Secretary of Energy will go to help bring down his own side of this debate.